Brain training games do not improve overall brain power, a scientific study launched by the BBC suggests. 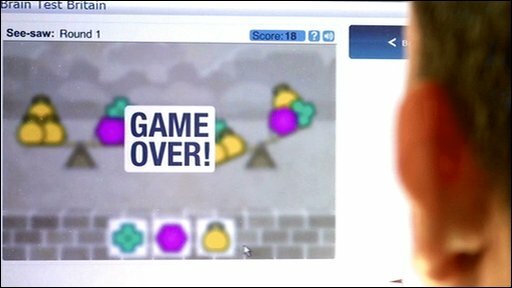 The largest ever investigation followed 11,430 people over six weeks to see what effect, if any, playing brain training computer games would have. But they say more work is needed to see if workouts for the mind can help keep the brain "fit" as it ages. Leading game maker Nintendo said their Dr Kawashima brain training games did not claim to be scientifically proven to improve cognitive function. In a statement it said the games require users to perform a number of "fun challenges incorporating simple arithmetic, memorization and reading". "In this way it is like a workout for the brain and the challenges in the game can help stimulate the player's brain," it said. All of the study volunteers were viewers of the BBC One science programme Bang Goes The Theory. The games tested were designed by scientists from the Medical Research Council and the Alzheimer's Society. To test the games, participants were asked to do brain training "workouts" for at least 10 minutes a day, three times a week for a minimum of six weeks. All were randomly assigned to one of three brain training groups. For a third of the volunteers, the sessions were designed to train their reasoning powers, planning and problem-solving skills. The second group played games designed to train short-term memory, attention, mathematical abilities and visuospatial skills. The remaining third were given web-browsing tasks that didn't target any specific cognitive skills. Tests before and after the training showed none of the interventions boosted people's ability to do everyday thinking tasks, although they did get better at playing the individual games and the specific cognitive tasks these involved. Dr Adrian Owen, a neuroscientist at the Medical Research Council, said: "The results are clear. "Statistically, there are no significant differences between the improvements seen in participants who played our brain training games, and those who just went on the internet for the same length of time." Clive Ballard of the Alzheimer's Society said: "This evidence could change the way we look at brain training games and shows staying active by taking a walk for example is a better use of our time." Rebecca Wood of the Alzheimer's Research Trust said: "This suggests that 'brain training' does not improve people's cognitive ability. "More research will tell us if these games have any effect on cognition as we age." Can You Train Your Brain?- A Bang Goes the Theory Special is on BBC One, Wed 21 April, 2100 BST and afterwards on iPlayer.